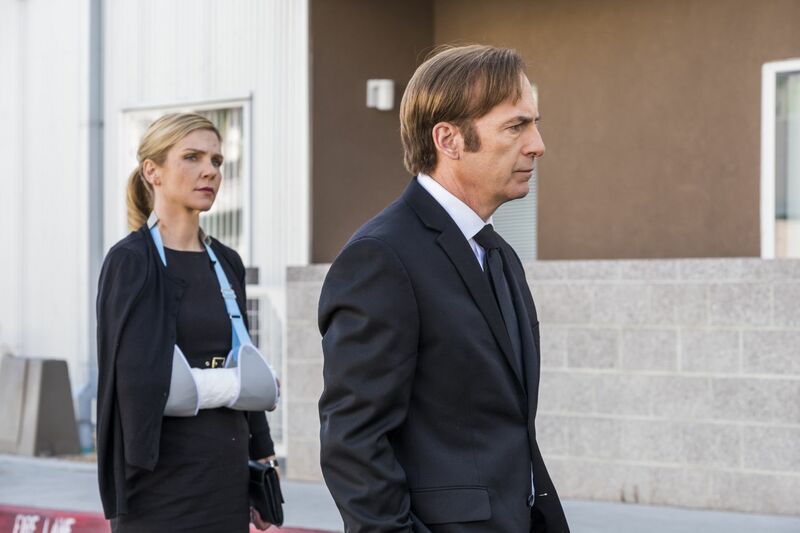 Bob Odenkirk as Jimmy McGill, Rhea Seehorn as Kim Wexler in the Season 4 premiere of AMC's "Better Call Saul"
Yellowstone Live. For four nights, a team of photographers and filmmakers will take viewers inside one of the greatest of our national parks. 9 p.m. Sunday, Aug. 5, through Wednesday, Aug. 8, National Geographic Channel. Sugar Town. The 2014 death of a young black man while in the back of a police car is the subject of a documentary about the controversial case, in which law enforcement in New Iberia, La., alleged the victim, handcuffed in the back, shot himself. 8 p.m Monday, Aug. 6, Investigation Discovery. Better Call Saul. Sometimes I get so absorbed in the surprisingly touching story of Jimmy McGill (Bob Odenkirk) that I almost forget that we're on the inevitable road to Breaking Bad's Saul Goodman. But as the fourth season picks up after the death of Jimmy's brother, it's clear the show will be calling up Saul sooner or later. 9 p.m. Monday, Aug. 6, AMC. Lodge 49. Wyatt Russell, Kurt Russell's lookalike son with Goldie Hawn, stars in this new dramedy as Dud, an affable ne'er-do-well who in the wake of his father's death, and an injury that keeps him from surfing, finds solace in a fraternal organization that already has its share of characters. Sonya Cassidy plays his twin sister, Liz, a waitress who lacks Dud's sunny disposition, maybe with good reason. 10 p.m. Monday, Aug. 6, AMC. Frontline. "Documenting Hate: Charlottesville," a joint project of PBS and ProPublica follows correspondent A.C. Thompson through the deadly weekend of the white supremacist rally in Virgina a year ago this month and as he investigates why many of those responsible for the racist violence haven't been brought to justice. 10 p.m. Tuesday, Aug. 7, WHYY12. Breaking Big. West Philadelphia's Lee Daniels, the producer behind Fox's Empire, is profiled in a new installment of the PBS series. 8:30 p.m. Friday, Aug. 10, WHYY12. Agatha Christie's Ordeal by Innocence. Bill Nighy, Morven Christie, Anna Chancellor, Matthew Goode, and Eleanor Tomlinson star in a twisted, three-part family murder mystery. Friday, Amazon.